Define wall system terms—specifically the difference between an air barrier and a vapor barrier. 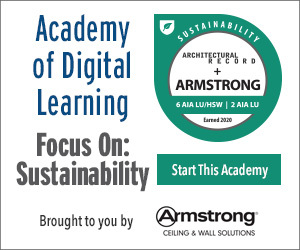 Explain the science of wall systems, including the potential impact on energy savings and the beneficial health effects of controlling moisture migration into living environments. Describe the detrimental impact of moisture infiltration into building materials and the safety concerns inherent in unsafe structures. Determine the proper wall system to use for a given climate in order to limit air and moisture movement and ensure the comfort and safety of building occupants. Wall systems are quite literally all around us, and they are more complex and dynamic than you might think. Despite their ubiquitous and seemingly mundane nature, an in-depth analysis of the science of wall systems and building envelopes could easily fill entire books—let alone this course. In this unit, you will learn the basics of wall system construction as they relate to air and waterproofing, the differences between air and vapor barriers, and how to determine the proper wall system for use in a given environment to maximize the comfort and safety of building occupants. An overview of air and vapor barrier principles for wall system designers and installers. The first thing to realize about wall systems is that there is no “magic” solution to perfect wall system waterproofing that fits every condition. Items that influence the overall performance of a building enclosure include the wall components utilized, project location, insulation type and location, and type of occupancy, for example. Given this level of variability, there is no one “ideal construction” to employ in every situation. Still, there are some general rules to help you choose the right system for your specific application. While we often look at the walls around us as solid barriers between us and the outside world, when it comes to air and water infiltration, they can be far less impenetrable than they seem. Installation mistakes during construction, poor wall system material choices, structural damage and other factors can contribute to air or moisture finding its way into or through walls, and the results can be ugly, costly or downright catastrophic. Air leakage is something that we never want to see in wall systems. Air leakage issues typically occur in areas of penetration in walls, window or door openings, foundation-to-wall transitions and wall-to-roof transitions—i.e., at any transition point or tie-in where detailing and material compatibility are vital. Not only can air leakage negatively impact building energy efficiency and occupant comfort by facilitating heating and cooling loss; it also exacerbates problems related to water infiltration. Water vapor transmission tends to occur even in properly assembled walls. One way moisture can enter walls is via a process called vapor diffusion in which water molecules move through porous materials from regions of high concentration to regions of low concentration by means of random molecular motion. 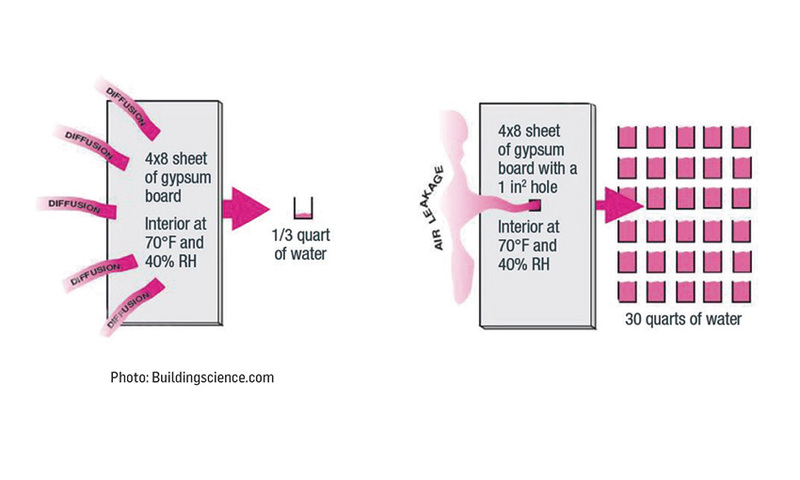 As long as moisture transmission is controlled, wet materials in a wall assembly will naturally dry via vapor diffusion. If moisture buildup is unmitigated, however, moisture-sensitive wall components may degrade or pose health risks. The difference in water transmission rate brought about by use of barrier material for vapor diffusion is substantial, to say the least. Air movement can vastly expedite the rate of vapor diffusion with a wall, causing problems within the wall assembly and potentially shortening the life of the structure. In fact, air leakage transports 100 times more water through a small void in a wall system than if vapor was diffused through a 4 feet by 8 feet sheet of barrier material. Next to bulk water leaks, condensation resulting from air leakage is the main cause of moisture problems within buildings. 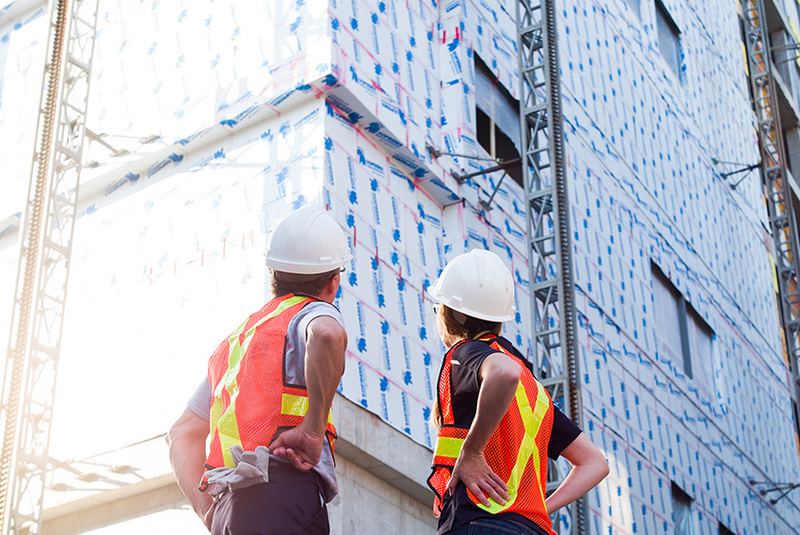 Because of the deleterious effects of air leakage and excessive moisture infiltration, wall systems are typically equipped with vapor control or “barrier” materials to protect the building during construction, then prevent air leaks and control vapor diffusion levels once the building is ready for use. Prevention of moisture problems is the most important step to ensure the long-term performance of wall assemblies, but it is often difficult to eliminate all sources of moisture during the lifespan of a building. With proper installation of barrier materials throughout wall systems, however, moisture accumulation can be restricted to a level that will dry naturally. Air barriers are intended to control the movement of air, but may allow moisture vapor to pass through. Permeable membranes help expedite the drying rate of walls, mitigating moisture-related concerns such as mold formation, wood decay and corrosion. In general, a more permeable membrane will enable more drying than a less permeable one, but it will also allow more water vapor to enter the wall assembly from the outside. A highly permeable membrane can help with drying, but it will be less effective if vapor diffusion is being restricted by other layers in an assembly. 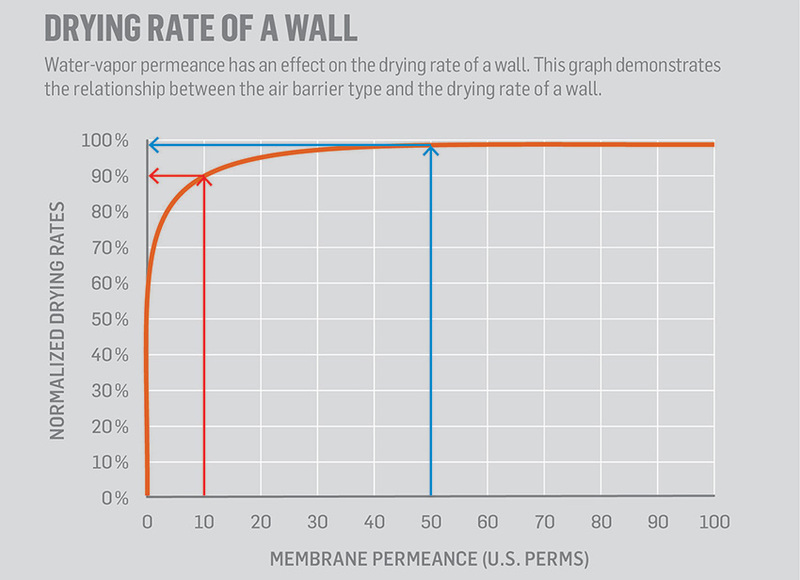 The drying rate of a wall system is affected by permeance of a membrane, but major increases in perms does not equate to major increases in drying rate. There is a general conception in the industry that the higher an air barrier’s permeance rating, the more it will facilitate wall component drying, but this is not always the case. The graph above shows that replacing a 10 U.S. perm membrane (the red line) by a 50 U.S. perm membrane (the blue line) improves the normalized drying rate by only 8 percent, which is negligible. Increasing from a 50 to a 100 U.S. perm rating will only improve drying times by 1 percent. In other words, a membrane that is five times more permeable will not allow the wall to dry five times faster. The membrane allows the wall to store moisture more quickly when vapor pressure is applied from the outside to the inside, but as a rule, increasing permeance has diminishing returns on drying rates, and in some cases it simply is not worth the investment to seek membranes with higher permeability. In addition, the drying dynamics of any wall assembly will be dictated by the material that has the lowest permeance to water vapor. 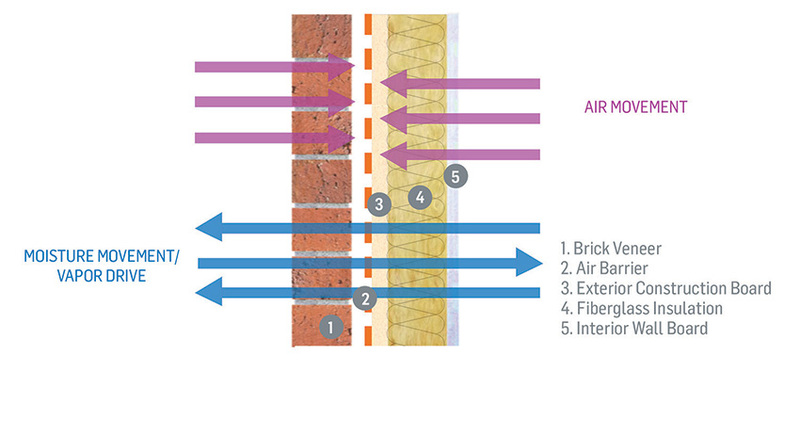 The potential benefits of a highly permeable air barrier will, thus, often be mitigated by another material that determines the assembly’s drying ability. It is essential to consider the wall type in which a membrane will be installed, as factors such as insulation presence inside the wall cavity, insulation presence outside the building envelope and water store capacity of the sheathing can complicate the drying of a damp wall. Impermeable vapor barriers control the movement of moisture by diffusing vapor, preventing it from moving through the wall system. An air and vapor barrier, colloquially called a “vapor barrier,” is a material that is placed on the exterior back-up wall of a structure and is designed to control the movement of air and vapor within the structure. The vapor barrier is illustrated by the solid orange line in the wall visual in this image. Since vapor barriers manage both air and moisture transmission, it is deemed a non-permeable membrane, “impermeable membrane” or “vapor retarder.” The industry recognizes materials that have a vapor permeance of less than 1 U.S. perm as a non-permeable membrane. When you look at permeable and non-permeable sheet materials, you will note that the non-permeable facer is smooth. Most non-permeable facers are made of a version of polyethylene (plastic) film. Alternatively, facers on permeable sheets may be comprised of a textured synthetic fabric or specialized thermoplastic polymer films, which allow vapor to migrate through the membrane.